Professor Dr. Julia Lane (right), and Professor Dr. Patricia McCarney (Director, Global Cities Institute), panel discussion, Urban Data and Urban Indicators for Sustainability, Sustainable Urbanism - New Directions Workshop, 21 March 2016. © Qatar University. New types of data and models have the potential to transform urban research and policy. Cities across the United States have appointed Chief Data Officers and created supporting offices. Federal funding agencies have been allocated funds for urban science, the President’s Council of Advisors in Science and Technology has issued a report on cities, and many private foundations are launching city-focused initiatives. The CUSP (Centre for Urban Science + Progress) Data Hub is a gateway to discovering, interrogating, analyzing, and visualizing urban datasets. The CUSP Data Facility has been developed to be a shared resource for NYC researchers, agencies, and citizens interested in using data in a secure environment for urban research and policy. © CUSP. 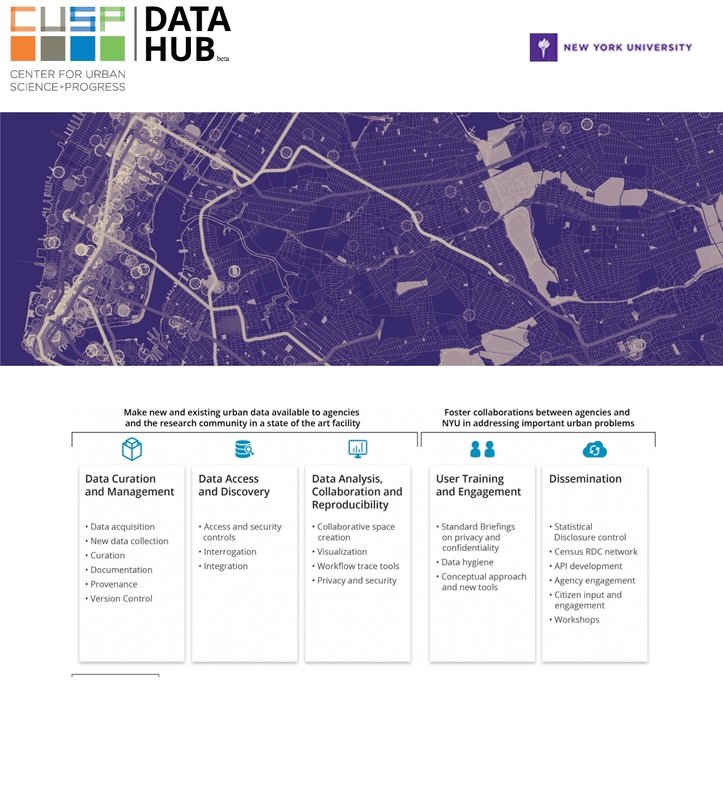 Universities are responding by both collecting and curating new types of data – for example, NYU’s Center for Urban Science and Progress (CUSP) hosts both city agency data and data based on satellite and ground-based remote sensing. It is insufficient, however, to simply collect and store vast amounts of data, particularly data that can contain sensitive data on human subjects. For data to have value, they must be actually used by cities and their citizens, comparable across cities, and statistically reliable. 1. Good Science. Each facility will be the equivalent of an urban statistical agency and based on sound science: a trusted independent resource that can be used to draw valid inference for decision-making based on new types of data. Each city agency would enable the curation, management and linkage of disparate data sources; facilitate analysis, collaboration and replication of results; and apply modern statistical techniques so as to limit the potential for reidentification of human subjects. 2. Cutting-Edge technology. Each facility will be inspired by the approach of such private sector initiatives as Amazon.com to build referral capabilities, of TripAdvisor and Yelp to promote metadata documentation, and automated tools for project management and reporting. Each will draw on modern cybersecurity techniques to protect data on human subjects. 3. High Quality training. Each facility will be the locus of data-based experiential learning modules that bring together city agency staff, urban researchers and subject matter experts to engage with and validate the quality of different data sources. The trainees will be tasked with addressing key urban issues, and trained in formulating problems, integrating, manipulating and analyzing data while grounding the approach in fundamental statistical concepts such as population frames, sampling, and valid inference. The results of the fully formed network will be the development of datasets and data collection methodologies that are comparable across cities; the establishment of a cross-city dialogue; and the improvement of decision-making within and across cities. Prof. Dr. Julia Lane is a Professor at CUSP (Center for Urban Science + Progress), NYU, and at NYU Wagner Graduate School of Public Service. She also serves as a Provostial Fellow for Innovation Analytics and Senior Fellow at the NYU GovLab. As part of the CUSP team, Dr. Lane works with the research team to build the CUSP Data User Facility. Dr. Lane is an economist who is the co-founder of the Longitudinal Employer-Household Dynamic (LEHD) partnership with the Census Bureau. LEHD data has been used to analyze commuting patterns for transportation planning, and the study of workforce turnover, pensions, and low-wage work. Julia Lane has led many initiatives, including co-founding the UMETRICS and STAR METRICS programs at the U.S. National Science Foundation. She conceptualized and established a data enclave at NORC/University of Chicago. This provides a confidential, protected environment within which authorized researchers can remotely access sensitive microdata, and also provides data producers with a secure dissemination platform. She also initiated and led the creation and permanent establishment of the Longitudinal Employer-Household Dynamics Program at the U.S. Census Bureau. Julia Lane has published over 70 articles in leading economics journals, and authored or edited ten books. She is an elected fellow of the American Association for the Advancement of Science and a fellow of the American Statistical Association.